Orange Rumble is a rich burnt orange but it isn't a dark burnt orange; it's more on the light side. I'd call it somewhat high saturation but with a little hesitation as it's holding back a little here and for me this is a good thing as it makes the ink distinct from other burnt orange inks. The ink isn't dry but I wouldn't say it's Rob's wettest ink either but I'd place it on wetter side of average. It's got some nice shading, depending on the paper (Rhodia is quite nice but Tomoe River flattens it a bit which isn't uncommon) and the wetness of the pen (too wet or to dry of a pen and the shading will not come through as much). There's no issues for this ink on and fountain pen friendly paper. This ink has a health amount of grey-silver sheen to it on the right paper. I say grey because the silvery-ness is not as shiny as the silver sheen on, say, Sailor Apricot. On some papers the grey sheen really stands on on the swatch but isn't that present on the written line but it's definitely visible on Tomoe River with a wetter pen. It gives the ink some extra character without being overbearing. Chromatography is straight forward (ignore the blue at the bottom). Just various saturation levels of the inks colour but there is a dark brown colour right at the tip. Dry time is a around average for both 80gsm Rhodia and 52gsm Tomoe River. There's no smearing on Rhodia 80gsm and the water resistance is non-existent. 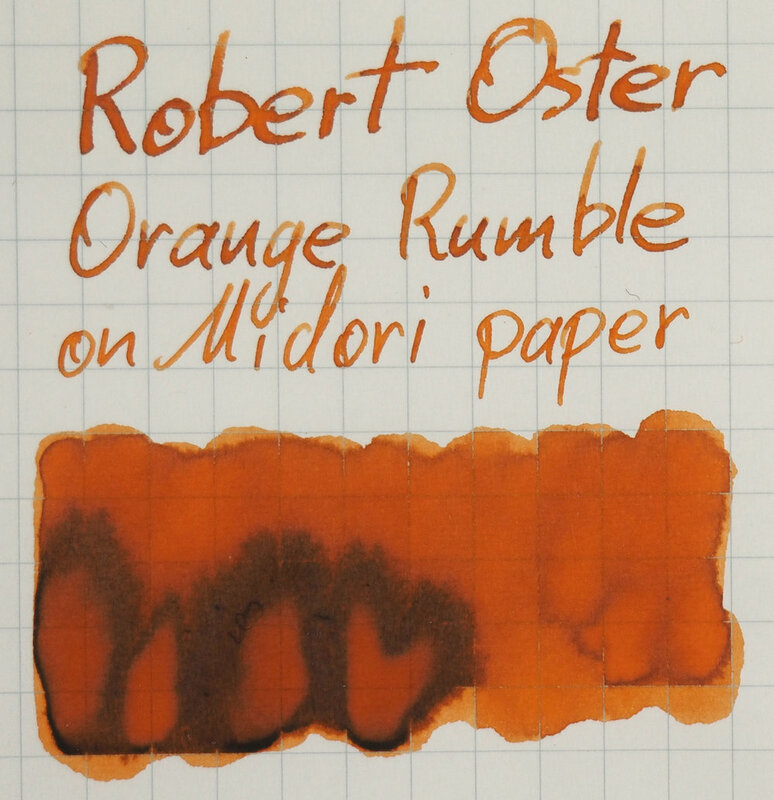 The ink has a great halo which a fair few Robert Oster inks have but this is nice and visible. The closest inks in my collection that I have chosen are Noodler's Apache Sunset, J. Herbin Orange Indien, Krishna Orange, Caran d'Ache Saffron, Franklin-Christoph Ink '17, Bungubox Hamanako Fresh Mandarin Orange, and Graf von Faber-Castell Burned Orange. Absent is Kyo-iro Frosting of Arashiyama which should be relatively close to this (but I had lent a friend my bottle and didn't have it for this review). Noodler's Apache Sunset is too light and surprisingly flat. J. Herbin Orange Indien is also too flat but the hue isn't that far of; just a little too brown and not quite as saturated. Krishna Orange is too dark and slightly too brown but in it's lighter shaded areas isn't a massive difference. Caran d'Ache Saffron is simply way too light. Franklin-Christoph Ink 17' is too red and too dark. Bungubox Hamanako Fresh Mandarin Orange is too saturated and too yellow. Graf von Faber-Castell Burned Orange is a touch too red and a hair too dark. For Rhodia I'd pick Krishna Orange or J. Herbin Orange Indien depending on your persuasion to lighter or darker shades. Tomoe River has a habit of sapping the saturation away from some ink. 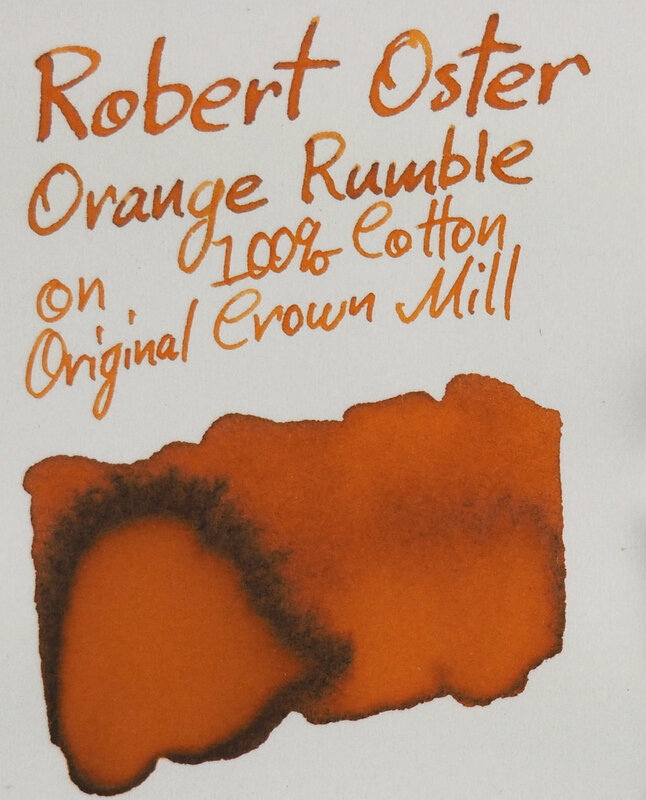 Some Robert Oster inks are susceptible to this and while Orange Rumble is not exception it's far less affected than others. It has gotten a little lighter and a little less saturated but not a huge amount. Shading has dropped a little as well but not terribly. Water resistant is still not applicable and the ink does smear a little (but not a huge amount). The same inks are as on Rhodia. Noodler's Apache Sunset isn't as light here but is still a little too light but the colour is a little closer. J.Herbin Orange Indien has lost a similar amount of saturation and darkness to Orange Rumble so is a similarly compared here to what it was on Rhodia even though both inks are now different! Krishna Orange has developed a very strong shading/Halo to it and has become darker really beautiful but less comparable now. Caran D'Ache Saffron is now much lighter; no comparison. Franklin-Christoph Ink 17 is still too red and too dark and Bungubox Hamanako Fresh Mandarin Orange is still too yellow and too saturated. Graf von Faber-Castell Burned Orange has become lighter but is still too red. For me only J. Herbin Orange Indien is close on Tomoe River, but maybe Noodler's Apache Sunset. Only two of the compared inks have a (practical) sheen to them; Bungubox Hamanako Fresh Mandarin Orange has a bright shiny silvery-white sheen to it and Krishna Orange has a brown-grey (slightly silvery) sheen to it. 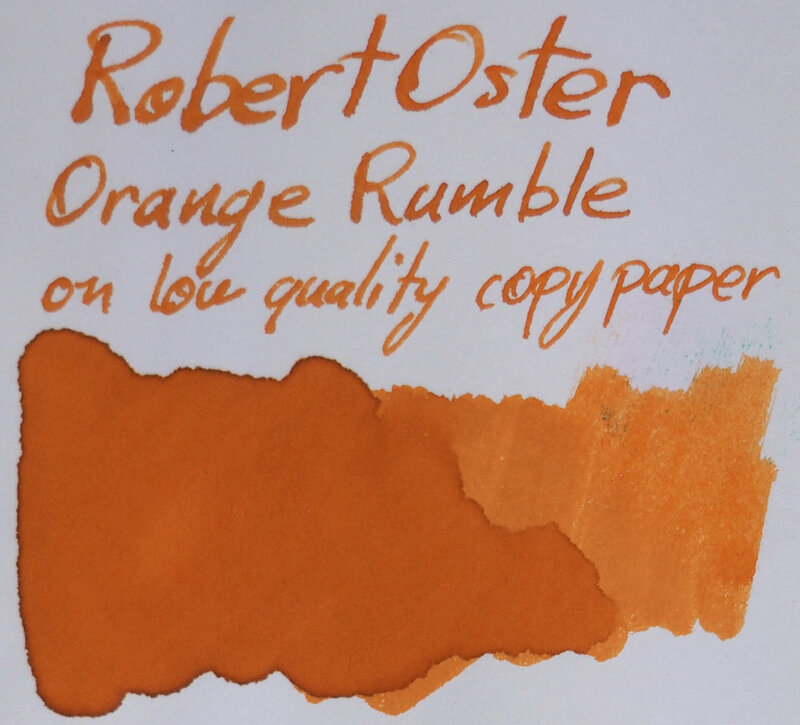 The sheen of Robert Oster Orange Rumble kinda sits in the middle between the two but if I were to pick I'd pick Krisha Orange as while the colour of the sheen is a little of the type of sheen is quite close as it is somewhat dull as well. As I said at the start I thought this looked like a nice ink but wasn't blown away until I saw it in person. I think this is a great somewhat-burnt orange. It's probably not the most unique orange in the entire world but I really like it and it stood out to me. Good characteristics – shading, sheen, not dry – and a great colour. What's not to like! 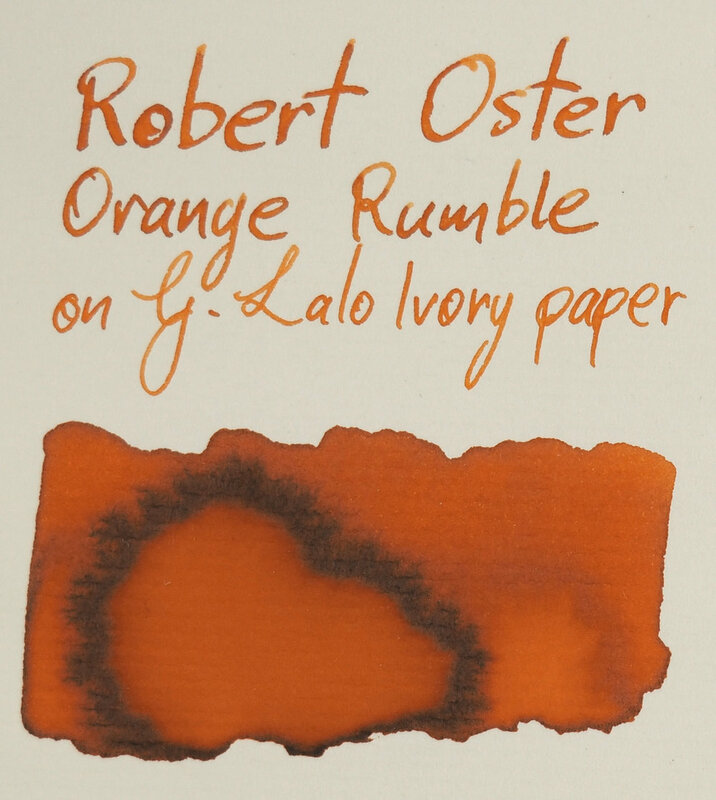 You can buy this ink from almost anywhere that sells Robert Oster inks (which is almost everywhere these days! ).